Lets Celebrate! Awards & New Instructors! There is always time to celebrate success and we have a few thing things to celebrate! Active have been providing activities across Scotland for the past 19 years. Activities for all ages & abilities, a whole range of groups; schools, stag & hen parties, youth groups, individuals to name a few. We aim to and provide quality activity days, residentials, adventure holidays and weekends. This Autumn we had our visit from the Visit Scotland quality assurance team. Active Outdoor Pursuits are a 5* Activity Provider. Thank you to all our clients past and present for supporting us and to our whole staff team who made this happen. Here is to many more adventures and activity days! 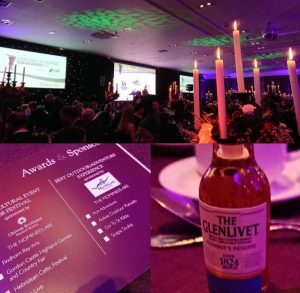 The Highlands & Islands Tourism Awards celebrate and recognize the best of the best in the Scottish Highlands for places to eat, drink, stay and experience. We were very proud to be shortlisted for the Best Outdoor Adventure Experience for 2017. The awards ceremony took place at Drumossie Hotel on November 3rd where we were treated to a fantastic dinner and evening. A whole room filled with the best that the Scottish Highlands has to offer, the atmosphere was incredible. Unfortunately for us we did not win the award but are very proud to have been shortlisted. Our congratulations to Go to St Kilda who took the award. Further congratulations to all the nominees and winners on the night, together we put the Scottish Highlands on the map for tourism. We welcomed 7 new enthusiastic trainee instructors to our Cairngorms base just over two weeks ago. The instructor training course is a 5 month intense course that provides training towards outdoor qualifications; SPA, SML, UKCC L1 (or 2) British Cycling Award to name but a few. The strong team have already completed and successfully obtained their Scottish Rafting Guide qualification. There was some great guiding by the team and strong team work coming through. The weekend had the team out in Cairngorm Mountains ticking off the Braeriach Traverse. One of the most iconic must do routes in the National Park. Braving the weather and cold water had the trainees in our two canyons! Jumps, Slides, Flumes, Abseiling and a Zip Line thrown in as well. Smiles and fun learning all round. We look forward to developing them all going forward. Watch this space for more updates! For more information on the instructor training course and for 2018/19 course dates please click here.